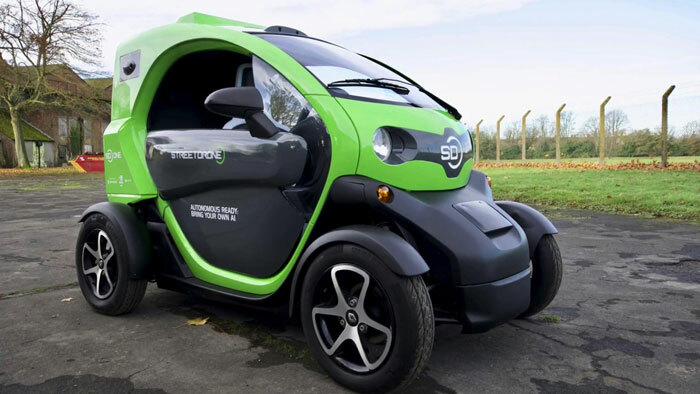 Streetdrone (UK) is partnering with Renault (France) to launch a modified Twizy electric car for autonomous driving research projects. The developers have direct access to the car’s CAN network. The vehicle's basic platform starts at about US-$ 9000 and comes with all what the research team needs. This includes the CAN-connectable XCU main controller and some sensors. The controller is redundant comprising the control ECU and the monitor ECU. There are installed seven cameras for a 360-degree view, two lidar sensors by Velodyne, and one laser safety curtain by Sick. The Streetdrone One car is ready to drive. It comes with open-source self-driving software. The XCU controls the steering and braking. Via the two CAN interfaces the redundant main controller communicates with the vehicle’s original ECUs. The higher-layer protocol is light-weighted, said the British company. Developers can access the CAN networks adding other devices or downloading software. Driving modes are programmable and the car can even be synced up with a roof-launched drone, which can follow the vehicle and provide birds-eye monitoring. Mark Preston, Streetdrone’s CEO, regards universities as the main customers. The researcher can deal with special tasks, such as the detection of specific animals or traffic situations and testing of all internal sensor measures. Volvo’s self-driving car was not able to recognize kangaroos, and other highly automated vehicles ignored internal sensor alerts.